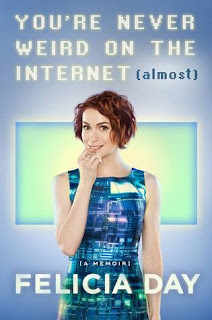 If that blurb wasn't clear, Felicia Day is enormously accomplished. A pioneering web creator, she also graduated from UT Austin with dual degrees in math and music at only 19. She's also smart, funny, and charming in her many, many, many YouTube videos. So I was excited to read her memoir about how this home-schooled violin prodigy became an actress & general internet superstar. The book starts about as I expected. Quirky stories told with Day's self-deprecating humor. It bounces from topic to topic a bit. Day's career has happened all at once. She seems to have her hands in a bunch of really cool projects at once, and the book is separated into chapters by project, rather than time. It makes it easier to follow, but a does make it a bit difficult to figure out just how much she was actually doing all at once (which was a lot!). If I'm nit-picking, I could've used fewer ALL-CAPS SENTENCES, and would have liked to see a paragraph or two on her time on Buffy, but on the whole I enjoyed it. The last three chapters, though, really pushed this book from a solid three-star that I'd recommend to Day's fans, to an incredible memoir that I'll recommend widely. Day talks honestly about her struggles with depression, anxiety, and physical health problems at the height of her success. She admits to several bouts of crippling mental health struggles, and how difficult it was to overcome them. Her last chapter on GamerGate describes the frustration, anger, and even danger that comes with being a woman in a traditionally male-dominated corner of the Internet. The raw honesty with which she describes her struggles is inspiring and empowering. Verdict: Affirmed. Prior to reading this memoir, I knew only of Day's immense success as a creator and actress. In "Never Weird" she lets her fans see her failures, and her success shines all the more brightly for it.